Over the last few weeks, I've noticed a large group of sheep whenever I walk through Happy Valley park, Llandudno, probably 20 or more of them. 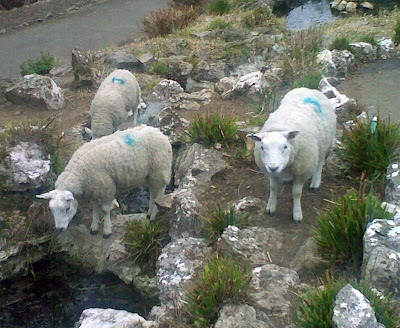 Having cropped the grass to a fine trim, they have now started munching their way through the plant stock of the Rock Gardens. Now, I see council gardeners working up there maybe once or twice a week but no-one seems to have done anything about removing the sheep. Whilst keeping the grass short is perfectly fine, destroying the hundreds of plants and shrubs in the gardens is not so desirable. - not to mention the trails of droppings they leave over all of the paths! Their backs are marked with a a 'J' - I assume they have come down off the Orme but can we hope that someone at CCBC will read this and take the initiative in returning them back home before all the plants are eaten and need replacing at great expense? The gate at the top of the gdns used to have a weight on it to close it, but that's been replaced by an ineffective spring. One could always telephone the Council Orme Wardens! They could then earn their keep! Moi, I took your advice and emailed a lady called Sally Piddock, who is a Great Orme Warden and is shown as the point of contact on the CCBC website, on the 17th March. No reply received as yet! Very disappointing service.